OPPORTUNITIES is compiled by the Harvard University Native American Program (HUNAP) and includes internship, scholarship, fellowship, grant, and career opportunities as well as announcements for conferences, workshops and symposia. This is the Opportunities Newsletter compiled by the Harvard University Native American Program. I. Follow HUNAP on Facebook and Twitter! 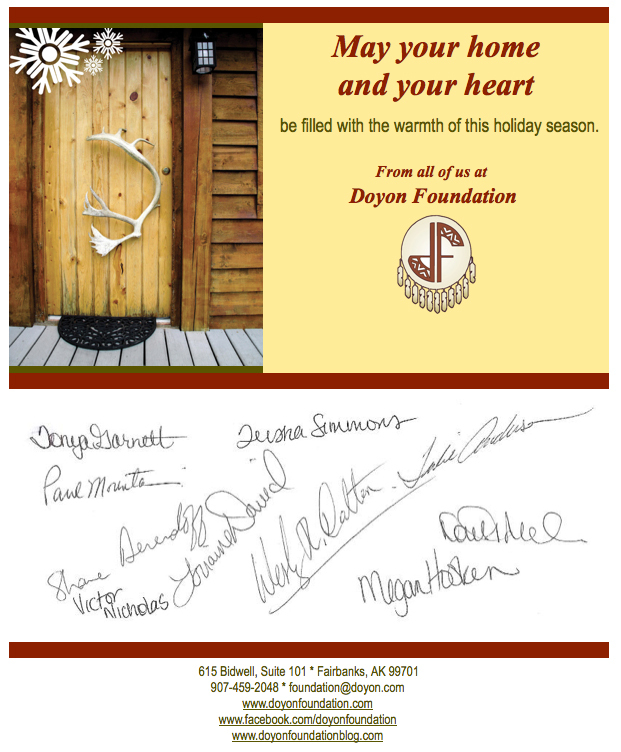 Doyon Foundation will close on Friday, December 23, 2011 at 12:00pm. The office will re-open Wednesday, December 28, 2011. Happy Holidays! Doyon Foundation is seeking a dynamic Scholarship Program Manager for a fast paced and energetic work environment. The position description can be found at www.doyon.com. For questions, contact Doris Miller, Executive Director, at 907.459.2050 or millerd@doyon.com. Apprenticeship Opportunity: The Alaska Teamster Employer Service Training Trust Joint Apprenticeship & Training Committee will accept apprenticeship Applications from January 18, 2012 through January 31, 2012. Applications are available beginning 12/19/11 on the website at www.akteamterstraining.com, in person at the Anchorage & Fairbanks Training Centers or by mail by calling Cheri Lipps, Apprenticeship Coordinator at 907-751-9785. Skills Interns will obtain include but not limited to: the opportunity to gain experience in the workforce, networking, and knowledge of their Native Corporation. For more information or to apply visit the Doyon, Limited website at: www.doyon.com. Doyon is excited to announce the opening of recruitment for Doyon Leadership Training (DLT), a 10-month, intensive leadership program. DLT is open to all Doyon shareholders and Doyon Family of Companies employees, and the deadline to apply is Thursday, January 12, 2012 at 5 p.m. Visit the website www.doyon.com to learn more about the program or to apply.